BepiColombo's Mercury Magnetospheric Orbiter in the Large Space Simulator at ESTEC, The Netherlands. MMO is Japan’s contribution to BepiColombo and will explore Mercury's magnetic field. A new Mercury probe has survived a scorching test run in a giant oven, showing that the craft can withstand the hellish heat near the solar system's innermost planet. The Mercury Magnetospheric Orbiter (MMO), part of the BepiColombo Mercury-mapping mission, tolerated temperatures higher than 662 degrees Fahrenheit (350 degrees Celsius) during the tests, which took place in the European Space Agency's Large Space Simulator (LSS). The BepiColombo probe, a joint mission between Europe and Japan, is slated to launch in August 2013. 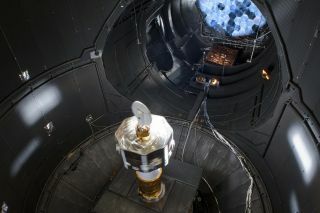 Located in the Netherlands, the LSS is the most powerful space simulator in the world, and the only facility capable of reproducing Mercury's extreme environment for a full-scale spacecraft, researchers said. The LSS had to be specially upgraded to perform the tests. The ESA-led BepiColombo mission, which consists of the MMO probe and another craft called the Mercury Planetary Orbiter, will encounter 10 times the radiation power experienced by an Earth-orbiting satellite, researchers said. The power of the sun can be measured in units called the solar constant — how much energy is received every second through a square meter of space at the distance of Earth's orbit. "Previously, the LSS was capable of simulating a solar constant or two. Now it has been upgraded to produce ten solar constants," Jan van Casteren, ESA BepiColombo project manager, said in a statement. The improvements were achieved in two ways: The simulator's lamps are now being used at their maximum power, and the mirrors that focus the heat beam were adjusted. Instead of producing a parallel beam of light 20 feet (6 meters) across, the mirrors now concentrate the light into a cone just 8.9 feet (2.7 m) in diameter when it reaches the spacecraft. This did the job for the MMO tests, creating a beam so fierce that a new shroud with a larger cooling capacity had to be installed to catch the light that missed the spacecraft. Otherwise, the chamber walls would have heated up too much, researchers said. The octagonal MMO, Japan's contribution to the BepiColombo mission, will investigate the magnetic environment of Mercury. It will be kept cool during its six-year cruise to Mercury by a sunshield, which also passed a thermal test. "The sunshield test was successful," van Casteren said. "Its function to protect the MMO spacecraft during the cruise phase was demonstrated." Once at Mercury, most of the sun's heat will be prevented from entering BepiColombo by special thermal blankets. These consist of multiple layers, including a white ceramic outer layer and several metallic layers to reflect as much heat as possible back into space. ESA's Mercury Planetary Orbiter (MPO), which is tasked with mapping the planet, will also endure scorching-hot temperatures. And MPO will go where no spacecraft has gone before: down into a low elliptical orbit around Mercury, circling the planet at distances that range between just 249 and 932 miles (400 to 1,500 kilometers), researchers said. At such close range, Mercury is like a hot plate on a cooker, releasing floods of infrared radiation into space. So MPO, which will begin testing in the LSS this summer, will have to deal with this blast as well as the solar heat, researchers said.